Club Hook is a fun social app, which allows its users the opportunity to meet prospective matches instantly and in person. 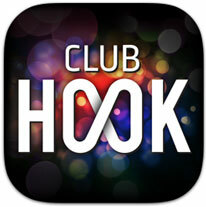 Designed for modern day connecting, Club Hook intersects the worlds of Social Networking, Online Social Gaming and Mobile Dating. It’s the ultimate ice breaker that eliminates the awkwardness from approaching someone you like! It’s a hookup game that takes place at a specific location, where you’ll get to anonymously select players you like and get discreetly matched with the ones who select you. The objective for Club Hook is to create an environment where players have a chance to actually see each other in person before choosing the ones they like to hook up with. So it’s real and it’s unique because it provides instant results! Be it in the Club, Party or Campus environment, The Club Hook game session is only active as long as the player is at the location of the game. Once the player leaves the location or logs out of the game, the session ends, insuring only real players in real time.